I found these differences fascinating, though I’m not sure what to make of them. Once leaving computing, students head to different majors with a big gender difference. Only 5% of women go into an Engineering field after CS, while 32% of men go into some form of Engineering. Why is that? As computing departments across the U.S. wrestle with increased enrollment, it is important to recognize that not everyone who becomes a computing major stays a computing major. In 2014, CERP collected data from a cohort of U.S. undergraduate students who agreed to be contacted for follow-up surveys in 2015. While most of the students surveyed remained computing majors (96%), some students changed to a non-computing major. As shown in the graphic above, students in our sample moved to a variety of majors, and the type of new major tended to differ by gender. Most men (69%) who left a computing major switched to engineering, math/statistics, or physical science majors. On the other hand, most women (53%) tended to move to social sciences, or humanities/arts. These data are consistent with existing social science research indicating women tend to choose fields that have clear social applications, such as the social sciences, arts, and humanities. CERP’s future analyses will explore why women, versus men, say they are leaving computing for other fields. The comments from students in the article below from Duke are just like the ones I hear from my students when I ask them how our introductory class is going. “Way better than I expected” and “I thought it would be all geeky” and “I can see using this!” You’d think with all the press about computing education these days that we would wouldn’t still have to explain all of this, but yeah, we do. Now she’s using her new computational savvy to expand a nonprofit she founded in high school to raise money for an elephant sanctuary in Thailand. via Computer Science Looks Beyond Nerds | Duke Today. Not sure how (if?) we can see this in the US, but it sounds really good. A sharp, witty, mind-expanding and exuberant foray into the world of logic with computer scientist Professor Dave Cliff. Following in the footsteps of the award-winning ‘The Joy of Stats’ and its sequel, ‘Tails You Win – The Science of Chance’, this film takes viewers on a new rollercoaster ride through philosophy, maths, science and technology- all of which, under the bonnet, run on logic. Wielding the same wit and wisdom, animation and gleeful nerdery as its predecessors, this film journeys from Aristotle to Alice in Wonderland, sci-fi to supercomputers to tell the fascinating story of the quest for certainty and the fundamentals of sound reasoning itself. With the help of 25 seven-year-olds, Professor Cliff creates, for the first time ever, a computer made entirely of children, running on nothing but logic. We also meet the world’s brainiest whizz-kids, competing at the International Olympiad of Informatics in Brisbane, Australia. ‘The Joy of Logic’ also hails logic’s all-time heroes: George Boole who moved logic beyond philosophy to mathematics; Bertrand Russell, who took 360+ pages but heroically proved that 1 + 1 = 2; Kurt Godel, who brought logic to its knees by demonstrating that some truths are unprovable; and Alan Turing, who, with what Cliff calls an ‘almost exquisite paradox’, was inspired by this huge setback to logic to conceive the computer. Ultimately, the film asks, can humans really stay ahead? Could today\’s generation of logical computing machines be smarter than us? What does that tell us about our own brains, and just how ‘logical’ we really are…? via BBC Four – The Joy of Logic. Ten years ago, professors in computer science departments everywhere wondered how undergraduates from a broad range of fields could be attracted to computer science (CS). We were convinced that this material would be vital for their careers, but we were up against negative stereotypes of programmers, and the prediction that most software jobs were about to be outsourced to the third world. The tide has turned! The graph below shows annual enrollments over the past decade for the introductory computer science courses at UC Berkeley, Stanford, and the University of Washington. At each of these schools, and at colleges and universities across the nation, the introductory computer science course is now among the most popular courses on campus, and demands for advanced computer science courses are at record-breaking highs. At Stanford, where more than 90% of undergrads take computer science, English majors now take the same rigorous introductory CS course as Computer Science majors. via Why are English majors studying computer science? « The Berkeley Blog. Dave Patterson and Ed Lazowska have written the above-linked blog post explaining why there has been such a rapid rise in enrollments in Computer Science at Berkeley, Stanford, and U. Washington. We’re seeing the same enormous rise in CS enrollments at Georgia Tech. Beyond the intro course, we’re seeing a dramatic increase in CS minors. At places where everyone is required to take CS (e.g., Georgia Tech, Rose Hulman, Harvey Mudd), students have the option of going beyond that first course, and because the first course is tailored for them, they’re more likely to succeed at it. At Georgia Tech, we’re seeing students take more than just the required course and pursing a credential in CS, within their major. English majors (and lots of others) are seeing that computing is valuable. 1. So what happened? First, today’s students recognize that “computational thinking” — problem analysis and decomposition, algorithmic thinking, algorithmic expression, abstraction, modeling, stepwise fault isolation — is central to an increasingly broad array of fields. 2. In addition to enhancing prospects within a chosen field, surely some of the reason for interest in computer science as a major or as a minor is to enhance employment opportunities after graduation. I totally buy that. That’s what Eric Roberts saw from his informal survey when the boom in enrollment first started. But my gut is a bad judge of these things. We really ought to test these claims, rather than make claims without evidence. Who is taking CS now? And why? And how does it differ between these institutions? In higher education, the response has been sluggish at best. Computer Science is usually found in colleges of engineering — as is the case at Berkeley, MIT, Stanford, and Washington — so one indicator of accommodation is the fraction of engineering faculty in the field. Less than a fifth of the engineering faculty at these schools teach computer science courses, a fraction nearly unchanged in the last decade. I strongly agree with the argument. The critical issue here isn’t about growing Engineering or if CS belongs in Egnineering. The critical issue is that computing is a form of literacy, not just a specialty skill, and we have to think about how to ramp up our offering of computing education so that it’s universally accessible. Finally, building successful, high-demand courses for non-computing majors gives us a different perspective on the current enrollment crisis. Students want these courses. Other schools on campus want to collaborate with us to build even more contextualized classes. While we still want more majors, we have an immediate need for more faculty time to develop and teach these courses that bring real computing to all students on campus. I have a lot more that I want to think through and share about the seminar. I’m doing a series of blog posts this week on live coding to give me an opportunity to think through some of these issues. I saw four sets of computing education research questions in live coding. These are unusual research questions for me because they’re Vygotskian and non-Constructionist. Live coding is about performance. It’s not an easy task. The live coder has to know their programming language (syntax and semantics) and music improvisation (e.g., including listening to your collaborator and composing to match), and use all that knowledge in real-time. It’s not going to be a task that we start students with, but it may be a task that watching inspires students. Some of my research questions are about what it means to watch the performance of someone else, as opposed to being about students constructing. I’ve written before about the value of lectures, and I really do believe that students can learn from lectures. But not all students learn from lectures, and lectures work only if well-structured. Watching a live coding performance is different — it’s about changing the audience’s affect and framing with respect to coding. Can we change attitudes via a performance? Vygotsky argued that all personal learning is first experienced at a social level. Whatever we learn must first be experienced as an interaction with others. In computing education, we think a lot about students’ first experience programming, but we don’t think much about how a student first sees code and first sees programming. How can you even consider studying a domain whose main activity you have never even seen? What is the role of that coding generating music, with cultural and creative overtones? The social experience introducing computing is important, and that may be something that live code can offer. Making visible. In a world with lots of technology, code and programmers are mostly invisible. 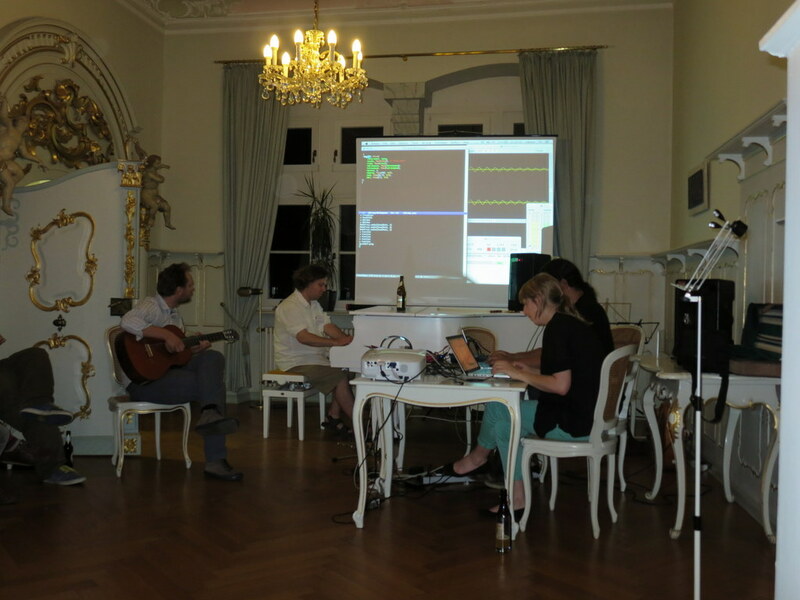 What does it mean for an audience to see code to generate music and programming as a live coder? It’s interesting to think about this impact for students (does it help students to think seriously about computing as something to explore in school?) and for a more general audience (how does it change adults’ experience with technology?). Separating program and process. Live coding makes clear the difference between the program and the executing process. On the first day, we saw performances from Alex MacLean and Thor Magnusson, and an amazing duet between Andrew Sorensen at Dagstuhl and Ben Swift at the VL/HCC conference in San Jose using their Extempore system. These performances highlighted the difference between program and process. The live coders start an execution, and music starts playing in a loop. Meanwhile, they change the program, then re-evaluate the function, which changes the process and the music produced. There is a gap between the executing process and the text of the program, which is not something that students often see. Code for music. How does seeing code for making music change student’s perception of what code is for? We mostly introduce programming as engineering practice in CS class, but live coding is pretty much the opposite of software engineering. Our biggest challenges in CS Ed are about getting students and teachers to even consider computer science. Could live coding get teachers to see computing as something beyond dry and engineering-ish? Who is attracted by live coding? Could it attract a different audience than we do now? 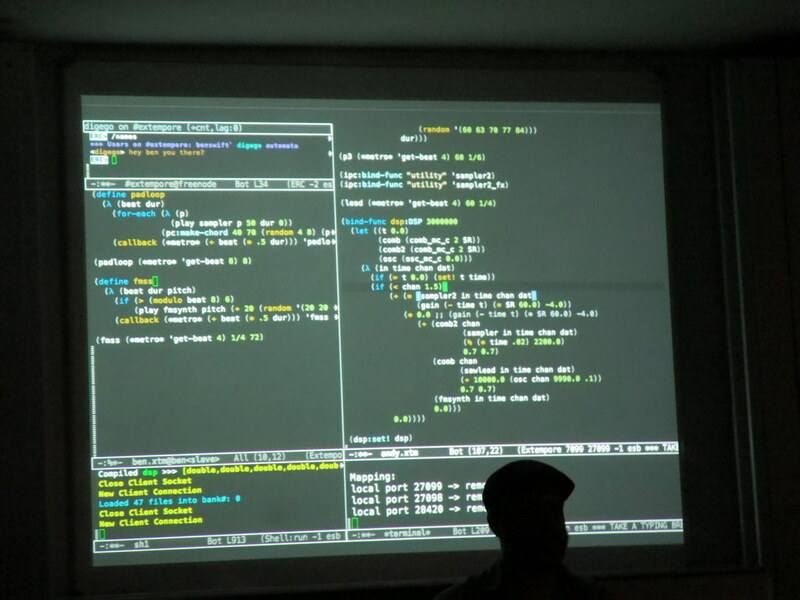 Could we design the activity of live coding to be more attractive and accessible? Collaboration. Live coding is a collaborative practice, but very different from pair programming. Everybody codes, and everybody pays attention to what the others are doing. How does the collaboration in live coding (e.g., writing music based on other live coders’ music) change the perception of the asocial nature of programming? 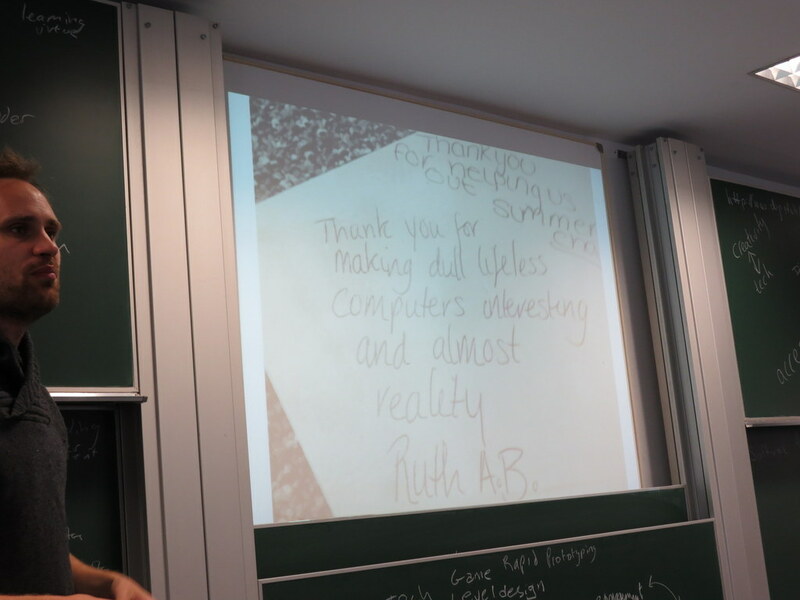 I’ll end with an image that Sam Aaron showed in his talk at Dagstuhl, a note that he got from a student in his Sonic Pi class: “Thank you for making dull lifeless computers interesting and almost reality.” That captures well the potential of live coding in computing education research — that activity is interesting and the music is real. In a class discussion, a student starts yelling at another student: “You moron! C# is a terrible language for that! You should use C++!” What do you do? I had a distractor that collected a surprising number of votes: “Just let it go – that’s the way CS students are.” And after the discussion period — that one still got some votes. The expectation that “That’s just the way CS students are” is surprisingly pervasive. Computer science teachers need to stand up to it, to demand change in culture and expectations. Later in my class, the students are reading chapters of Diana Franklin’s new book. So, you see, I was all too familiar with what my daughter was going through, but I was unprepared for the harassment to start in high school, in her programming class.I consulted with friends — female developers — and talked to my daughter about how to handle the situation in class. I suggested that she talk to you. I offered to talk to you. I offered to come talk to the class. I offered to send one of my male friends, perhaps a well-known local programmer, to go talk to the class. Finally, my daughter decided to plow through, finish the class, and avoid all her classmates. I hate to think what less-confident girls would have done in the same situation.My daughter has no interest in taking another programming class, and really, who can blame her. via To my daughters high school programming teacher | USENIX. A fascinating set of studies! (Follow the link below to see the description of the second one.) It reminds me of our GaComputes findings about the importance of early computing experiences for minority students. Just taking a single CS class changed the women’s definitions of what a computer scientist is. I’ve written on Blog@CACM about how under-represented minorities were more likely than majority students to have had some CS experience in middle or high school that influenced them. These studies together support the argument that having some CS in K12 will likely have a significant impact on later attitudes towards computing. First, they asked undergraduates from the UW and Stanford University to describe computer science majors. They found students who were not computer science majors believed computer scientists to be intelligent but with poor social skills; they also perceived them as liking science fiction and spending hours playing video games. Some participants went so far as to describe computer scientists as thin, pale (from being inside all the time), and having poor hygiene. “We were surprised to see the extent to which students were willing to say stereotypical things, and give us very specific descriptions. One student said computer science majors play ‘World of Warcraft’ all day long. And that’s a very specific, and inaccurate, thing to say about a very large group of people,” Cheryan said. However, women who had taken at least one computer science class were less likely to mention a stereotypical characteristic. There was no difference in men’s descriptions, whether or not they had taken a computer science class. via More women pick computer science if media nix outdated ‘nerd’ stereotype | UW Today.